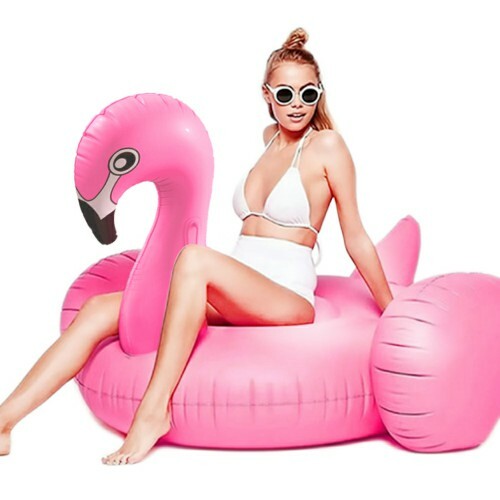 Each Pink Flamingo Ride-on is 6.2 feet long, 6.2 feet wide and 3.8 feet high when inflated, weighing 5.7 pounds. 2 handles are available on the neck for holding on. 1 ride-on per pack. These ride-ons are must-haves if you’re throwing a pool party! They are ultra soft and comfortable when inflated, people of all ages love them and ride on them all day long! With this ride-on, your party will stand out from all the rest! Gone are the days when you had hassle before having fun! Have you ever taken hours to inflate a ride-on, yet in the end it still didn’t work? NEVER AGAIN! The featured quick-inflate valve allows you to inflate these ride-ons within minutes and keeps air in nicely. You will get your party started in no time!